HackForGood BIGDAY acknowledges, among best projects in HackForGood 2017, those who have continued their work and reached a greatest consolidation degree. 17 teams from all over Spain have moved to Madrid to transfer their results. During the act it has been introduced to all presents Wayra, a Telefonica Open Future’s platform for business incubator, a mentoring and networking space. 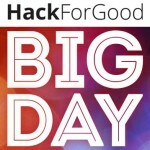 This 5th edition of HackForGood, promoted by Telefonica in order to provide solutions to big social issues, has been focused in big data apps and services development. The initiative is co-organized with Politecnica University Telecommunication ETSI, HazloPosible Fundation and Mashme TV startup, along with support of the Telefonica Chairs Network, along with Telefónica-UNIR Chair in Digital Society and Education. UNIR HackForGood Award in “Education, Culture and Open Society” has rewarded in 2017 best app related with an open culture and society. Standards have been based on social impact and the importance of the solved issue, creativity and innovation used in development, and consolidation degree reached. The Award is sponsored by Telefonica-UNIR Chair in Digital Society and Education , part of the Research Institute in Technology & Innovation in Education (UNIR iTED).